What to do when you need to rattle your cage? It’s easy. You crank up the volume, set your hair on fire, and listen to Rocky Athas’ new release, Shakin’ the Dust. After listening to this footstompin piece, the only problem you will have is how to stop playing it. With his sixth new release, Rocky gives music lovers eleven well-produced tracks that will energize blues lovers. Rocky opens with “Dictator,” a piece that is heavy on his bass. In the third track, “Lifeline,” I love the lyrics, “In a sea of lonely drowning desperately.” There is a cool guitar riff that happens throughout the piece that sounds like an acoustic-electric at work. I love it. Anyone who reads my reviews knows I’m a Texas Blues fan, and Rocky’s sixth track, “Texas Girls” makes me smile. “I Need Your Love so Bad,” a smooth slow-dance piece, will get its fair share at the venues. The band finishes off with the last track, “Villanova Junction” a creamy but wicked Jimi Hendrix cover. 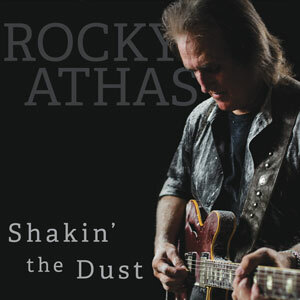 Rocky Athas’ Shakin’ the Dust is an album that shakes more than dust. It fabricates a musical fashion that hits the right spot. With a staggering history, Rocky will have an immense future with Shakin’ the Dust. I’m J.R. Joseph Miller, and this is Rocky Athas Shakin’ the Dust.